Rain and drizzle from a slow-moving storm that pushed through North Texas behind a cold front Tuesday is expected to taper off Wednesday morning. NBC 5 meteorologist Grant Johnston said 1.32 inches of rain was measured over the last 24 hours at Dallas-Fort Worth International Airport. The rainfall brings the total for the year to 29.16 inches, down 4.9 inches for the year. See a map showing rainfall totals since midnight here. Johnston said clouds are likely to stick around throughout the day, though the sun may briefly come out late in the afternoon. Temperatures are expected to hold through the 50s most of Wednesday, with the high climbing near 61 this afternoon. Overnight, temperatures could drop into the high 40s. On Thursday, sunshine will return before another chance of rain arrives on Friday. This weekend, it's expected to be sunny with temperatures in the 70s. Elsewhere in Texas, a National Weather Service flash flood watch for South Central Texas was scheduled to expire at 7 a.m. Wednesday. The service said Tuesday night that 1 to 2 inches of rain were expected with as much as 3 to 5 inches in some areas. With the heavy rain received last weekend, the forecasters said there would be rapid runoff of any new water. Late Tuesday a band of storms stretched from Del Rio to north of San Antonio, moving slowly to the east. Torrential rains left as much as a foot in a 12-hour period last weekend near Austin. In Austin, a man's body was recovered from a flooded creek as investigators worked to determine whether the death was related to recent storms. Austin police on Tuesday night were contacted by a man who was out walking and found the unidentified body in Williamson Creek as flood waters receded. Police have no recent reports of a missing person matching the description of the body. An autopsy has been ordered. The National Weather Service says rain that's soaked the Austin and San Antonio areas this week, leading to flash flooding, should move on by late Wednesday. 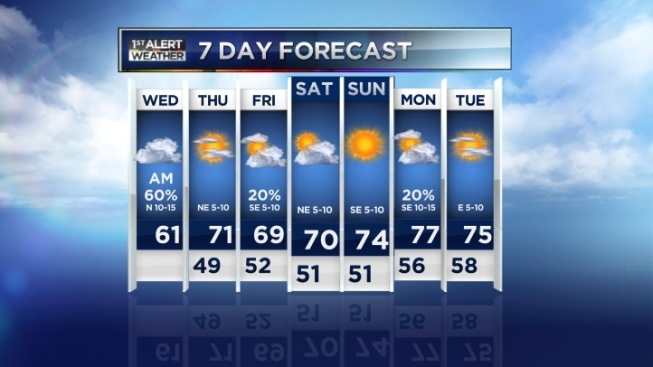 A chance of showers lingers through Thursday. Experts say some rivers in South Texas will likely remain above flood stage for a few days.